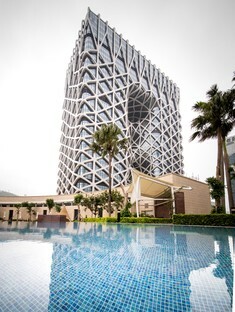 On the foundations of a building that was never built, Zaha Hadid Architects designed a new resort for what is considered Asia’s City of Dreams, Macao, in the Cotai district, the part of the city dedicated to tourism and fun. 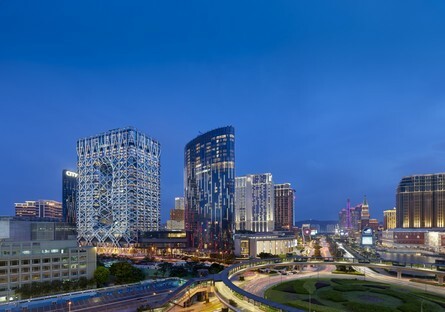 Macao, the Las Vegas of the Orient, has quickly become one of Asia’s most popular tourist destinations, and certainly its top gambling spot. 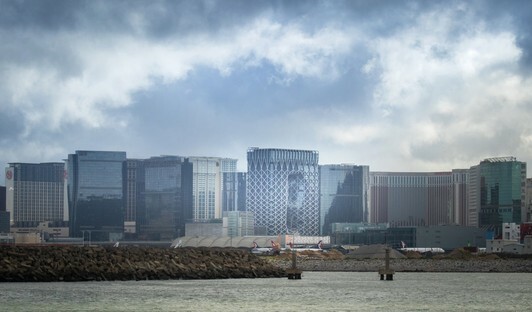 The city had more than thirty-two million visitors in 2017, and all this action is inevitably affecting the city’s urban development, particularly in the Cotai strip, an area created by draining the land between the two islands of Taipa and Coloane. 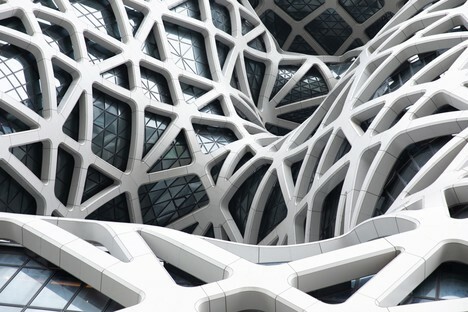 Cotai is home to Foster + Partners’ new Apple Store, discussed recently in Floornature, and to a new resort opened on June 15: Zaha Hadid Architects’ Morpheus Hotel. 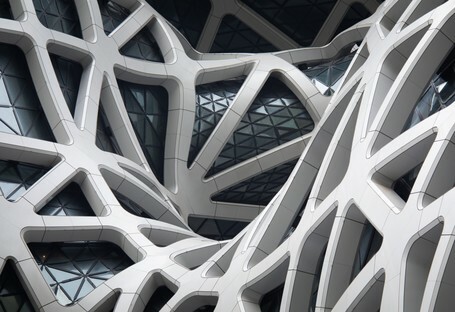 In 2012 Zaha Hadid Architects were asked to design the Morpheus Hotel, a resort complex incorporating a casino, two theatres, shopping areas, restaurants, event halls, a pool and a panoramic spa. 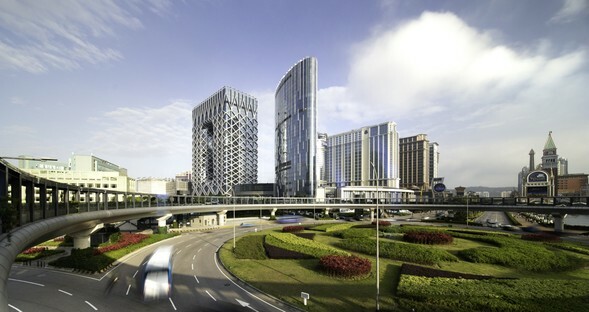 The site had been intended for a previous construction, a residential tower block that was never completed, of which only the foundations had been built. 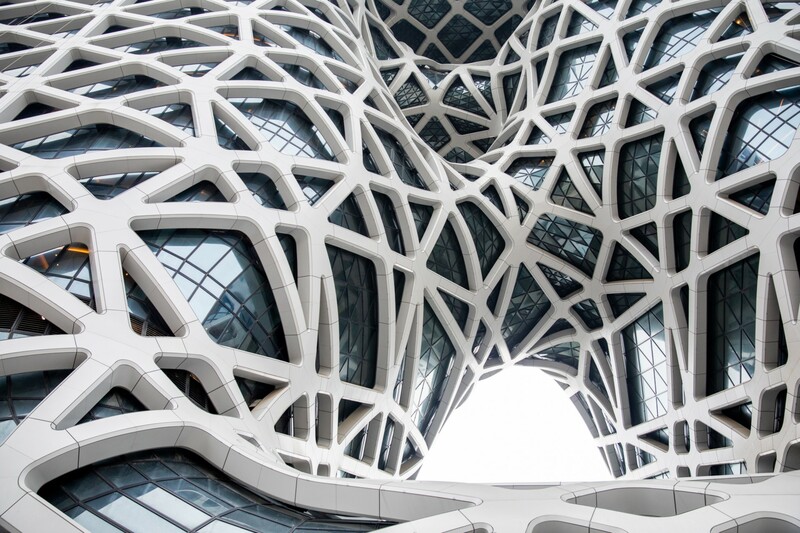 The volume of the new building emerges out of a vertical extrusion of the original rectangular floor plan, rising 40 floors and 160 m into the air. 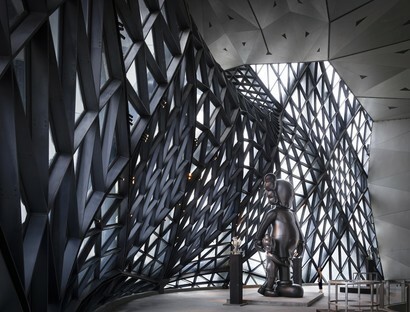 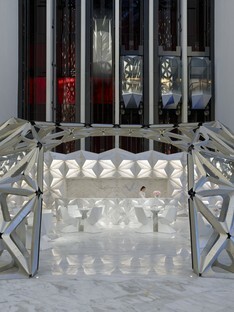 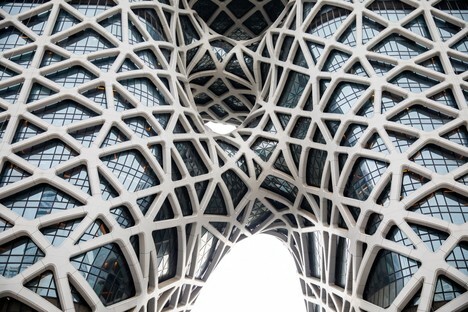 The monolithic block surrounded by an exoskeleton is sculpted inside to create what the architects call “urban windows”, the voids visually connecting the common spaces in the hotel with the city. 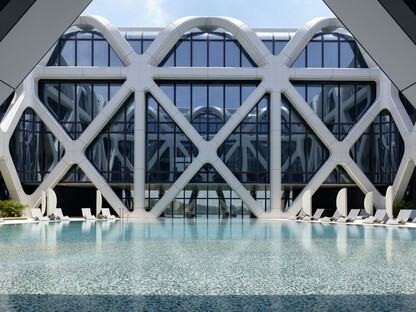 The rich and ancient Chinese tradition of jade carving is revived in the design of an exoskeleton that winds continuously around the entire volume of the hotel, a design that also defines and characterises the building’s interiors. 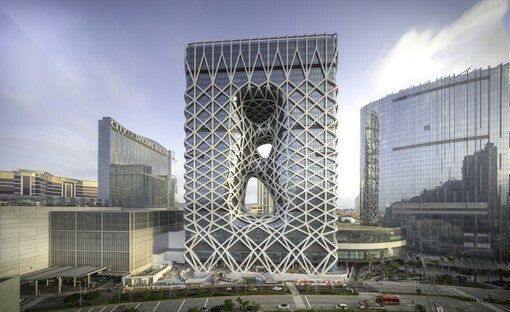 The building may be interpreted as two towers joined at their base and crown. 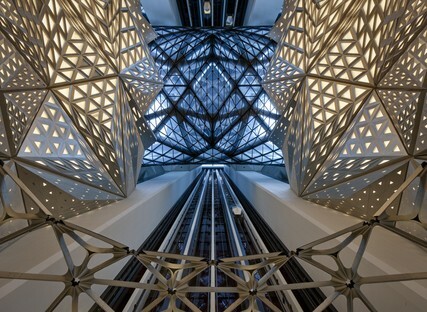 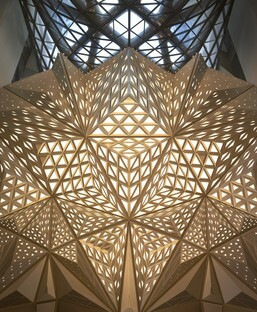 In the two blocks, the mesh of the exoskeleton becomes less dense and the interior contains public functions. 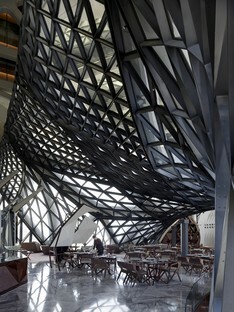 As revealed in Ivan Dupont’s photographs, the three voids inside the built volume seem to be generated by whirlwinds that put the building’s north and south façades in contact: A solution that maximises the number of rooms with a view and ensures equal distribution of rooms on both sides of the building. 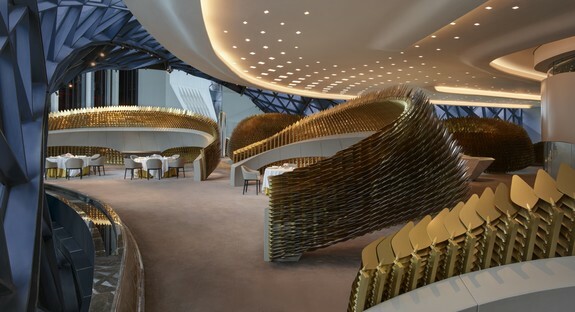 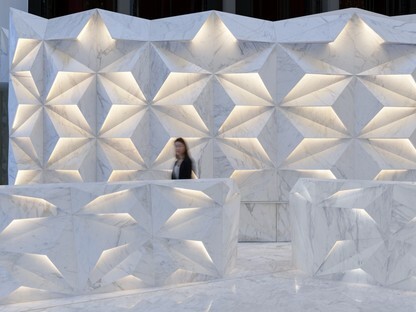 The bridges created between the three voids are spaces containing restaurants, bars and guest lounges, featuring service by award-winning chefs such as Alain Ducasse and Pierre Hermé. 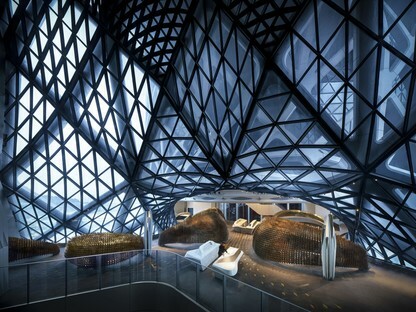 In presenting the Morpheus Hotel, architect Viviana Muscettola of Zaha Hadid Architects emphasised that the project combines three important factors: an optimised layout, a rigorous structure and a sculptural shape. 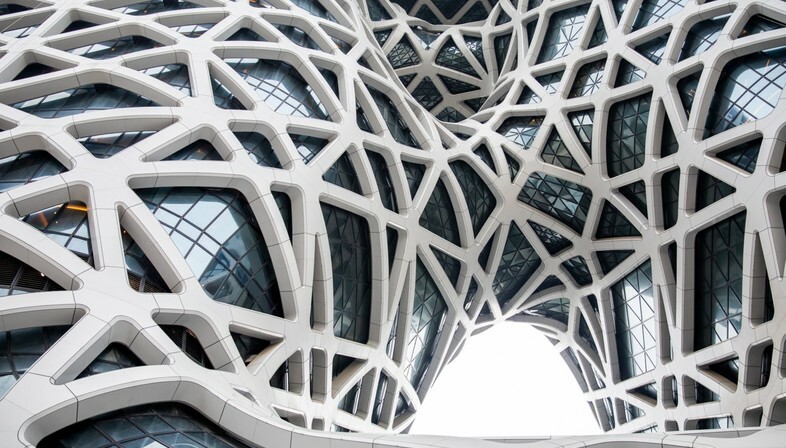 There is no reference to traditional forms of architecture, but the building is born out of the conditions on the site, constituting a new form of architecture linked with its context and the setting for which it was designed.